Another year, another viola d'amore and piano piece . . .
My ultimate plan is to make this series of pieces come to a hour of music, one year at a time. This one has 53 measures. This picture is part of an article in today's the local paper about the Collegium Musicum Consort I play with on Friday afternoons. Meet my friend Daniel Morganstern through his brand new memoir blog Heard But Not Seen. I would suggest beginning with the first post called "Separate Checks," and progressing backwards (which translates to progressing forwards in blog motion). Danny recently retired from the pit of the Chicago Lyric Opera, where he served as its principal cellist since the founding of the company. For much of his career Danny also spent part a great many years sitting in the principal cello seat in the pit of the American Ballet Theater. He is a great friend (as well as a great cellist). He is also a terrific story teller. 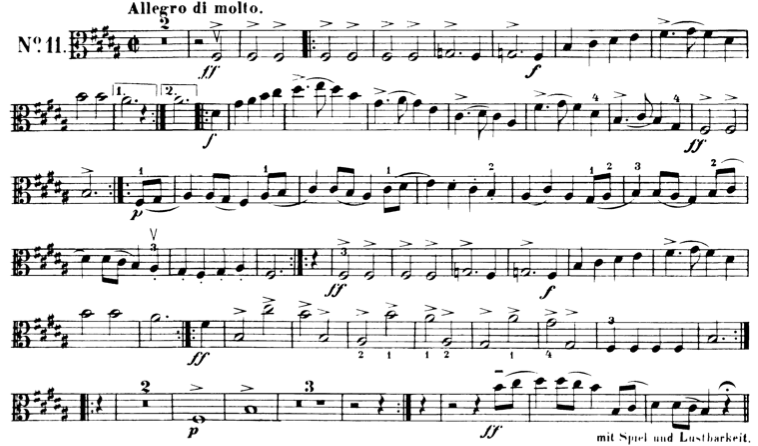 Look at this nasty passage (that begins in the third line and gets repeated) in the key of B major from Mendelssohn's incidental music for his pocket version of A Midsummer Night's Dream. Nobody writes exposed passages like this for the viola in truly viola-unfriendly key of B major. After tearing out some hair and fighting with scales and double stops in B major for a while, I finally realized that this passage is a variation on the "Bottom" theme (i.e. the donkey). In order to give it that certain donkey-esque je ne sais quois, Mendelssohn gave it to us, in this key, and in this register. Now there's a smart composer. And one with a sense of humor. It takes a sense of humor to play it too. But I found this Victor Borge version of the same Hungarian Rhapsody which is even funnier than the cartoon.
. . . Let me condense my feelings into a sort of credo. I believe that a great new era of eclecticism is at hand, and eclecticism in the highest sense. And I believe that it has been made possible by the re-acceptance of tonality, that universal earth out of which such diversity can spring. And no matter how serial or stochastic, or otherwise intellectualized music may be, it can always qualify as poetry as long as it is rooted in earth. I also believe, along with Keats, that the poetry of earth is never dead, as long as spring succeeds winter, and man is there to perceive it. I believe that from that earth emerges a musical poetry, which is, by the nature of its sources, tonal. I believe that these sources cause to exist a phonology of music that results from the universal known as the “harmonic series,” and that there is an equally universal musical syntax which can be codified and structured in terms of symmetry and repetition, and that by metaphorical operation there can be devised particular musical languages that have surface structures noticeably remote from their basic origins, but can be strikingly expressive as long as they retain their roots in earth. "Do you fiddle around with opera?" I tried for years to figure out why I could never actually hear single pitches when I played col legno on my viola. I also wondered why my pizzicato notes often sounded so "papery," but the actual reasons I decided to try a new tailpiece had to do with things far more practical. My left wrist and my G string peg did not seem to want to work together to bring the string to pitch, and the strings I like to use (Larsen) happen to be a little thick for the holes and slots of my old tailpiece. My instrument would also rattle when the balls of the strings would buzz against the wood of the tailpiece. I decided to modernize, and I got a tailpiece made by Les Bois d'Harmonie. All my problems are solved, and my instrument sounds far better (when played with the bow normally as well as when playing pizzicato and col legno--with wood of the bow) than it ever did before. I can also make a sound in ponticello (playing on the bridge) that is not ugly. Notice that the strings do not actually contact the tailpiece itself, except for the places they connect with the fine tuners. Perhaps this is one the reason the instrument feels so free. The fine tuners are made of carbon fiber, and they are very snug, so no matter how much vibration comes their way, they do not rattle. And it is a very beautiful tailpiece. These tailpieces cost a lot more than standard tailpieces, but, over the long term (the life of the instrument), the extra expense is worth it. I have been thinking about thinking again. But today I was "thinking of some thinking" while practicing Bach. Like my student, I tend to think some of the time, most of the time, or, perhaps, my attention darts from one thing to another while I am practicing. Sometimes I find myself noticing things I have never noticed before as the notes of a familiar piece go by my eyes and get translated, through my arms and fingers (and all the little nerves and muscles that connect them to the rest of my anatomy) into something filled with detail. Sometimes I find myself at the end of a piece, and it is as if I had been transported in time from the beginning to the end, without the slightest memory of the journey. Sometimes I get an idea for a blog post. Playing a piece of music by yourself is sort of like taking a walk by yourself along a familiar path. 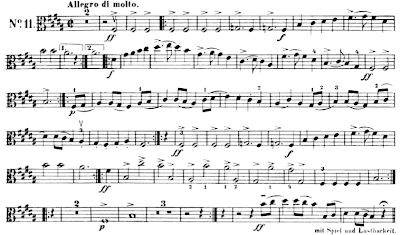 The notes, rhythms, harmonies, dynamics, and indications of articulation put in by the composer are the details of the landscape that do not change (under normal circumstances) like the pavement, the beginning and end points, the trees, the houses, the hills, and the obstacles that can't be avoided. If a log runs across your path, you need to be careful, every time, to avoid stubbing your toe or tripping. When you know that the obstacle is coming up, you can prepare yourself ahead of time. Eventually you learn not to think about the obstacles, and simply avoid them out of habit. But I digress. Let's both take a moment to contemplate obstacles you could find in walking paths and in music. Now I'll get back on track. There are variables that make it possible to say with complete confidence that you can never walk the same path exactly the same way. There are big things like temperature, light (which itself is always changing), wind, and weather, and there are our ways of reacting to them by what we are wearing. Footwear is usually pretty important. It is a different experience walking a mile in heels than it is in sneakers, but if we are used to walking in heels, we make adjustments (we must labor to be beautiful). It is far more difficult to play certain pieces on the French Horn than it is to play them on the piano, but we make adjustments (we must labor to play the French Horn beautifully). Sometimes, for expressive reasons, string players choose fingerings that are difficult to play easily, but we must labor to play stringed instruments beautifully. There is a walking speed that is comfortable and habitual, but we can always walk more slowly (if necessary) or more quickly (if necessary). Walking slowly we might observe more of the things that change along our path like the particular state of the trees, the birds, the squirrels, human beings that we might see and might see us (perhaps they might see us walking slowly and observing details about the pavement, and they might think we're a bit nuts). Walking quickly, we might enjoy the physical challenge of moving fast, we might enjoy the way our heart rate goes up, or we might be trying to work off anger or express the joy we feel being part of nature. We also might be trying to get somewhere fast, and we might be in a panic. In that case we often miss the landscape. Sometimes we count steps. Sometimes we play games. Sometimes we kick rocks. When we practice familiar pieces (or scales and exercises), we free our mind to take in what it wants to. When it is a complicated or particularly well-written piece, like a piece of solo Bach, the landscape is rich, and we can see whatever patterns we want to see at a given moment. We can observe the way the rhythm relates to the harmony, we can pay attention to the consistency of the sound we are making, we can pay attention to a particular element of technique, and observe the way it applies to what we are playing. We can stop, go back, and play something again. We can listen for intonation. We can mess around with agogics, we can mess around with syntax, and, with Bach, we can mess around with dynamics and articulations. We can observe the vast number of possibilities available to us in our musical landscape, or we can pay close attention to the details of the "pavement." Changes in weather are analogous to changes in our moods, the state of our health, the level of our blood sugar, the amount of sleep we get (or need), the amount of caffeine we had (or need), the amount of time we have (or need) to practice, the comfort of our clothes, the comfort of the room. There are thousands upon thousands of little things that contribute to the way we might play a piece of Bach at any given time. This is why playing Bach never gets old. The path may be familiar, but there is so much to observe and experience that the path is never the same. When I entered the blogosphere I had a working relationship with a reliable music publisher who, until he died, did a great deal to promote the music I wrote. I also had plenty of places to write articles for publication, but I did not enjoy having my work edited (for content) because what I had to say did not fit the commercial goals of the publication. I wrote CD reviews for a magazine (and still do) where my content was left intact, so I knew the joy of being able to state what I felt was the truth in print. My first blog posts were articles that I had written at the request of music magazines, but never saw publication as articles. I also had put in many years in radio, back when radio was a kind of two-way conversation between the person doing the show and the person listening, and the person doing the show was somewhere within a 50 mile radius of the listener. I had many years of experience as a performing musician as well, and had a nice working relationship with my community and the musicians who floated in and out of it over the years. I also had a teaching job at a community college (and still do), and wrote program notes for an orchestra (and still do). I can't believe that I am having nostalgia about something that never existed in real time and in real space. When musicians (I'll call them "classical musicians) first discovered the blogosphere as a "place" to find like-minded people and to present their ideas about music and music making for discussion, it was like being in a cafe in Vienna at the dawn of the 20th century. I used to feel a wonderful sense of camaraderie there, wherever "there" happened to be, and felt a nice balance between my normal working life and my "sidebar" life in bloggery. What was lacking in my daily life could be found in the connections I made through writing and reading musical blogs. It was a lot of fun. After my publisher died, his company was sold to a large entity that had its own agenda. That agenda didn't include promoting my music, so I had to figure out a way to do it myself. That's when I made my thematic catalog blog. I also decided that I was no longer interested in writing music that could only be distributed (sold) by a publisher who may or may not decide to promote it. Musical publishers have the unique ability to decide what they want to make available and what they want to keep unavailable. Most of my published music is available in libraries, so I thought that a catalog blog would be the best way to direct people to music I have written. I am proud of the music I have written, and I don't want it to get too lost in the din. When I realized that the Werner Icking Archive (now incorporated into the IMSLP) was a perfectly reliable place to make my newly-written music available for musicians to play, I decided to forgo the idea of making 10% royalties on sales of music, and make my music available to musicians without any exchange of money. Keeping track of money is a task that I abhor, and with the amount of money that performing musicians make, considering them a "market" is rather distasteful to me. Being productive is important to me, and communicating with people is important to me. Selling is not. Unfortunately, in this commercially-driven world, selling is the way the exchange of intellectual proper is evaluated. Bloggers without commercial agendas seem to have slipped out of the musical blogosphere, and the commercially-minded bloggers have taken over. Norman Lebrecht, who I gave a few points to for his interview with Thomas Quasthoff, is contributing to the death that he seems to want for classical music by reporting on gossip from its underbelly. Unfortunately there is little to read at his Slipped Disc blog (notice that I don't have a link) these days. For a while I was enjoying some lively discussions in comments, but there is little worth commenting upon there anymore. It is not a blog about music, it is a blog about superficial musical activity. I don't really care about the music "scene" in large. I care about music. For a while, while he was writing The Rest is Noise, Alex Ross was the king of the musical blogosphere. All bloggers wanted to be noticed by him, and a "nod" from Ross was a feather in the cap of any musical blogger. He was a "pro" because he blogged at The New Yorker . Though I have found many of Ross' New Yorker articles worthwhile, I was not particularly impressed by the book. I suppose I was in the minority. Perhaps some people no longer participate in the musical blogosphere because the effort of writing does not give the kind of feedback that they expected it to give. A single voice in the wilderness can be loud and can have a great impact, but when you have millions of single voices offering their opinions about music, you get a cacophonous mess. Perhaps some people have gone elsewhere to blog for money at commercial blogging entities (those that sell advertising), where they might get paid a little bit for their writing. I'm hanging on because I don't have an alternate agenda. I need to have contact with people in the "outside world" because I always have. I'm not afraid of being wrong when I state an opinion, and though sometimes I end up having the "last word" in a discussion about something, that is not my goal. Perhaps, in this age of Facebook and twitter (two entities I don't participate in because of their superficiality) the blogosphere will never return to its former "self." One blogger I enjoy reading jokingly defined blogs as being "so 2008". Perhaps that says it all. But, for the sake of people who prefer to communicate in words rather than captioned pictures, and in paragraphs rather than the number of characters you are allowed in twitter (whatever that number is), I'll remain where I am and who I am. The first "round" is a resume and sample piece round, which happens between July and September. The final round, held on September 7 in Cleveland, is kind of like the Iron Chef cooking competition: a secret musical ingredient is given to the five composers who are chosen to participate. They are given this "ingredient" at 9:00 in the morning, and have five hours to produce a piece, complete with score and parts. Each composer gets the use of a piano, a computer with Finale or Sibelius, and a printer, and they have to finish their piece by 2:30. The composers lose points if they need to take extra time to finish. Each composer gets 30 minutes to rehearse his or her piece piece, and at 8:00 that night everything is performed in a concert that will be broadcast on WCLV FM radio and simulcast on line. Three judges will judge the pieces based on the use of the secret ingredient, originality, technical command, and overall presentation. The Prix de Rome music competition began in 1803 and was held every year until 1968. From what I know about Lili Boulanger's experience, composers had four weeks to write a piece or a series of pieces, and they had to adhere to strict guidelines. I don't recall any mention of composers having access to a piano during the composition period (but I guess Boulanger had such a great ear that she wouldn't have needed one anyway). Speed composing is not my idea of fun (but neither is speed cooking). I imagine that there are people who would love to enter this, just for the sport of it. I wonder what a musical "secret ingredient" might be. An unusual instrument? A tone row? A text to set? A theme to make variations on? An unusual meter? An unusual mode? An electronic tape? Someone is thinking of some thinking . . .
A saying of my father's, "You have to think all of the time, not just some of the time," permeated my household when I was growing up. I don't recall if he ever actually said it to me when I was a child, and I never really understood what he was saying it in reference to, but it does pop into my head from time to time, particularly when I am practicing the viola. I was teaching a lesson the other day, and like many young students, my student had trouble paying attention to one or more of the tasks at hand. I decided to quote my father, and since it was a viola lesson, I figured that words from one of the great masters of the instrument might carry special weight. ME: My father would say "You have to think all of the time, not just some of the time." STUDENT: (After a second or two) I suppose I think some of the time, most of the time. Earlier this afternoon, my friend Nina introduced me to Telemann's musical impressions (in the form of violin duets) of Johathan Swift's Gulliver's Travels. The jokes above are obvious, but this one, with the unfamiliar noun "Aufweckern," has me stumped. You can download the music here, and you can listen to a recording here. I have been enjoying reading the selection of letters offered on the blog "Letters of Note" for a couple of weeks now. Today's post, a letter from the lead singer of a rock group I have never heard of to his 16-year-old self threw me into a personal tail spin. The idea of reading successful people writing letters to themselves to tell them that everything will get better is really not my idea of fun. I read some of the first volume of Dear Me in a book store a few months ago, and had no desire to look at it again. When I think about the problems I faced as a 16 year old person, they are pretty much the same problems I face today. Sure. I could write a letter to myself and tell myself that the skin and hair problems associated with hormonal changes are temporary. I could tell myself that the physical awkwardnesses connected with not fitting into the airbrushed standards of "beauty" are also temporary. I could even tell myself that having to spend the best years of my life trying to function within a society of hormone-dazed adolescents who have a false sense of freedom is temporary. Those problems are luxuries as far as I'm concerned. Start playing a string instrument now. Don't wait until you are 30. While you are at it, take piano lessons. Take your school work seriously. Your teachers are not doing you a favor by not expecting you to work to your potential. Consider going to a real college rather than a trade school (Juilliard). You might find other paths in addition to music. You are never going to be taller than 5 foot 1 and a quarter inches, but some day in the future someone will design jeans that will fit you. Don't expect people to change, and don't count on the physical world remaining the same. All the important buildings of your childhood (including your elementary school, your junior high school, and your public library) will be turned into other things. Going "home" will never feel like being "home," because the house you grew up in will be changed completely. The musical maturity you want to have will come with time and experience. There are no short cuts. Music gets better with time. Many of the pieces of music you love now will remain true friends for life. By the time you are 50 people will stop thinking you are 16. They may even take you seriously some day. It's been a while since I put a recipe post here, so before the midwestern wind (which is furious at this moment) blows all of the flowers off the redbud trees, I'm quickly making a post commemorating the colors of early spring that features what I believe is the tastiest and most beautiful potato salad I have ever made. It is the first time I have made it without onions (it was to share with a friend who can't eat onions), and I found the omission to be an enhancement. The quantities here are approximate, so you can give a little here, and take a little there. Cut the potatoes in half and boil them in salted water for 10 to 20 minutes, or until they are just soft. At the same time you can cut the asparagus spears into 3-inch lengths and steam them until they are just tender and still crunchy. The asparagus will only take a couple of minutes, so after they are cooked drain them and plunge the spears into ice water so they will stop cooking and stay crunchy. While the potatoes are cooking, put the mustard and olive oil into the bottom of a serving bowl and stir them for a bit to make a paste. Add the wine vinegar to the paste, add the tarragon leaves (discard the stems), and then add the yogurt. Plunge the asparagus into the mixture, rinse the potatoes in cold water and then drain them. Plunge them into the mixture as well. Mix everything up, add salt and pepper, and refrigerate until you are ready to eat. It really does taste best cold, so allow a lot of cooling time. I came across this statement about dodecaphonic music from Grazyna Bacewicz. For me the work of composing is like sculpting a stone, not like transmitting the sounds of imagination or inspiration. The majority of contemporary composers work as systematically as bureaucrats. If there is no inspiration one does the menial "workshop" jobs, if there is inspiration the creative work continues. Discipline, strict discipline in composition is essential to for me. There is a saying: the house will fall down if it were to be built without principles. However, since dodecaphony does not appeal to me very much I am sitting alone and working out my own system. [Letter of Grażyna Bacewicz to her brother, Witold (Vytautas Bacevicius), 23 October 1958]. I also came across this photo on the above website. 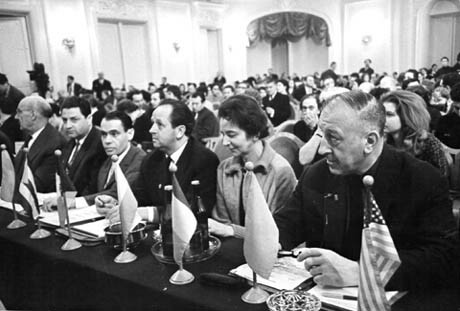 Bacewicz is sitting on a Jury in Moscow in 1960. I recognize Leonid Kogan, so I imagine that it was a violin competition. Since there are flags from around the world, I imagine it was an international violin competition. I had an extraordinary day yesterday. In the afternoon I read chamber music that was all new to me (The Benjamin Dale Phantasy for Viola and Piano, some viola and piano pieces by Theodor Kirchner, and some trios by Arnold Bax, Philipp Scharwenka, and Prince Heinrich XXIV Reuss of Köstritz. Physically exhausted (one really shouldn't play the viola for three hours in a row without a break, but I did), I spent the hour driving to my next rehearsal listening to a recording of violin and piano music that was mostly new to me, and then played the viola part of Shostakovich 5 for the first time (it was a awesome experience). During my ride home I heard a violin and piano suite by Malcolm Arnold, a violin and piano piece by Joaquin Rodrigo, and a string quartet by Félicien-César David. All three pieces were new to me, and all were fantastic ear-opening experiences. I was so giddy with happiness that I didn't even notice any of the physical tolls of the day (and evening). Seeing the video below (which I found on Charles Noble's Nobleviola Blog) made me understand why. This is why we do what we do. We make ourselves happy with music (and in my case it happens to be connected with musical discovery), and we share that happiness. That's it. That's all that matters. And we need to keep reminding ourselves that it matters. Every day. I really should have been doing other things, but when the postal carrier delivered my set of Schmidt ballpoint cartridges, I had to construct my new Noligraph right away. I should have documented my process, but my hands were busy with the doing. I can tell you that this "Newligraph" writes better than the Noligraph because the weight is better in the hand, and the length allows for better balance. It feels kind of like a carpenter's pencil. Here's what I did. I cut two pieces of cardboard (Sean Malone, who is responsible for this particular adventure, suggests the kind of cardboard that is used for legal pads) 15mm wide and 15 mm long. Then I cut two more pieces 15mm wide and 80 mm long. I lined the cartridges up with a ruler, and, following Sean's suggestion, bound them together with scotch tape. I placed the taped cartridges on top of the bottom 140 mm piece of cardboard and placed the two shorter pieces of cardboard beneath the cartridges. Then I put the other 140 mm piece on the top. I bound them together gently with scotch tape, and then wrapped the whole bundle in masking tape. I made the top out of cardboard and masking tape as well. Total cost? The cartridges cost $5. The rest of the material, being normal household stuff, is negligible. Total time? It took me about 30 minutes, including taking the photographs and writing this post. The traditional markings string players use to indicate on which string a particular pitch should be played are Roman numerals. When they are notated above the staff, they indicate which string to play on. When we want to indicate position, we tend to use Roman numerals as well, so we put them in a different place (usually below the staff). When you have two sets of Roman numerals to consider, one above the staff, and one below the staff, things can get confusing. Roman numerals also take up a lot of vertical space on the page, and with all the other information given on pre-printed music (not to mention ledger lines), things can get cluttered. Here's an example of clutter from the Franck Violin Sonata. The other day I came across the Phantasy for Viola and Pianoforte by Benjamin Dale, and noticed the elegant markings he (or Lionel Tertis, the editor of the piece, or Schott, who published it in 1912) used to indicate which string particular pitches should be played on. These markings made immediate sense to me, and this is the way I plan on marking fingerings from now on. Pitches on the A string are pretty obvious for violists, so there is no reason for using a single line for the A string. Two lines indicate a pitch should be played on the D string, three lines indicate it should be played on the G string, and four lines indicate that the pitch should be played on the C string. The lines are always below the finger number, and they act like icons that lead directly to location without the need of translation (or more numbers). 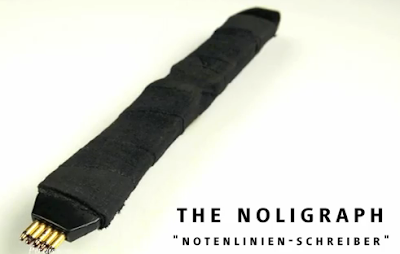 This picture, taken from the final frames of the above video, shows that the artist made a cloth-wrapped extension for his Noligraph. 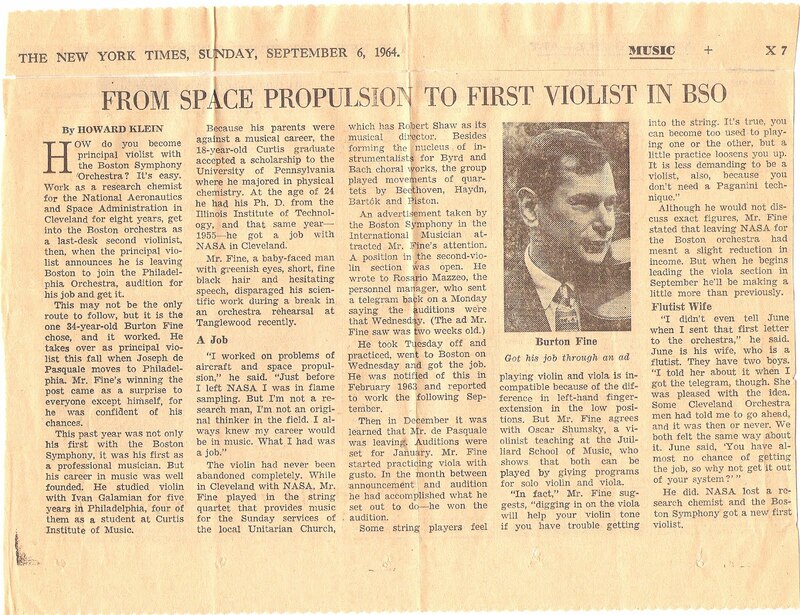 My aunt sent me this article from the September 6, 1964 New York Times. It is pretty astounding the way the musical world has changed during the last half a century. Howard Klein mentioned that my parents had two boys. I must not have been at home during the interview. I recall that even at the tender age of five, I was pretty comfortable roaming around the neighborhood without adult supervision. It WAS a different world. Last night, while looking for a blank sheet of paper to write down a musical idea, I came across a manilla file folder. I decided to try my Noligraph on it, and found that it took the ink really well (something that normal cheap paper doesn't always do to my satisfaction). This morning I boldly opened up the folder to its full and impressive width, made some broad and bold Noligraphic staves, and had the most wonderful time writing. The file folder paper is extremely durable, just the right color, takes pencil very well, erases well (always a good thing), and allows for a stable enough surface to write on while the paper is on a music stand. It's also cheap (a box of 100 costs $10). What I like best, though, is the size. I love the staff size that the Noligraph offers, and I love the fact that I can continue a musical thought (at this size) without having to go on to a new system after a measure or two. Some composers proudly claim that they never write at the piano--that they do everything in their heads. I find that there is nothing like being able to hear the actual sound of the instrument in real space while I am writing for it. And this file folder music paper sure makes it satisfying. This is a term I came up with some years ago (2006, to be exact) to describe the joy of writing counterpoint. I just thought I'd share it here. Though the music is serious, rare, and very well played, this recording is actually a successful April Fool's joke (as the pseudonyms of the violist and the pianist reveal). The violist's character is described in the liner notes as a student of Lionel Tertis and the pianist is described as a champion of York Bowen. Both women are said to be in their 80s, though the violist has only been a woman since 1961. Before she was a Dame would she have been a Sir? I had never heard of Dame Avril Piston, so, being a dutiful researcher, I search for a male titled British violist named Piston, but I found nothing. The playing, particularly the viola playing, does not sound like the playing of an octogenarian. Violists in their eighties, if they can still play at all, tend to vibrate slowly and often play out of tune in the high register. This violist, whoever s/he is, has fine intonation in the high register, a lovely and supple vibrato, and a great deal of power. The pianist is equally fine and equally strong. My questions led me to seek these musicians out on the internet, where I came upon a page of hilarious photos. It still took me a while to realize that the joke was on me. 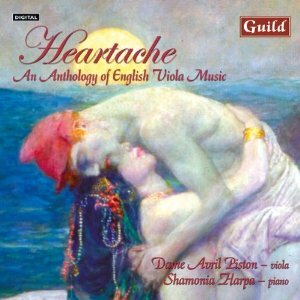 Joking aside, this is a very nice collection of 20th century English viola music, much of it inspired by Tertis. There are recordings of the Bridge and the Clarke that I prefer to this, but I enjoy being introduced to the rest of the music, particularly the pieces by Alec Rowley, Adam Carse, and Eric Coates. David Vernier was fooled. Walter E. Langsam, who made a comment on Tom Roper's blog, suggests the true identity of Shamonia Harper could be Stephen Hough, who has an excellent April Fool's post of his own today.